2 nts Trinidad Priced from $6,295 per person in a party of two. For larger parties, please see price table below. Explore the fascinating country of Cuba, from Havana's historical Old City to the charming colonial city of Trinidad, both UNESCO World Heritage sites. Visit humanitarian and cultural community projects and meet local leaders working to improve the well-being and creative fulfillment of the people of Cuba. Depart the USA to Havana. Upon arrival at Jose Marti airport in Havana, you will be met by Ya’lla Tours USA’s representatives and your guide. Drive through Revolution Square, the administrative and political center of Cuba. Continue through the once fashionable residential area of Miramar, which retains its pre-revolution air of exclusivity. Continue to your hotel for check-in and overnight. A special welcome reception & dinner will be at the Destinos paladar. Depart for the Bay of Pigs or Playa Girón, about a 2-hour drive from Havana. A force of U.S.-backed, anti-Castro Cuban exiles attempted to overthrow the Castro regime here in the Battle of the Bay of Pigs. Visit the Museum. 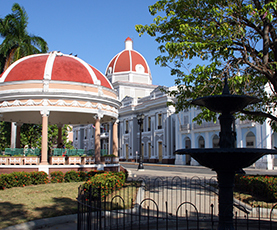 Drive 1 hour to the city of Cienfuegos, a UNESCO World Heritage Site. Visit José Martí Park, surrounded by beautiful Neo-classical buildings. Lunch will be at the Villa Lagarto Paladar. After lunch, visit the Palacio Del Valle restaurant, known for its synthesis of architectural styles. Then drive along the Paseo del Prado promenade, one of the longest in Cuba. Continue to Trinidad for dinner and overnight. Dinner tonight is at Guitarra Mia paladar. Spend the morning on a walking tour of Trinidad, a living-museum of Spanish colonialism. The whole city, with its fine palaces, cobbled streets and red-tiled roofs, is a national monument and a UNESCO World Heritage Site. Much of the architecture is Neoclassical and Baroque, with a Moorish flavor reflecting the town’s heritage of conquistadors. Visit the Plaza Mayor in the center of town. Right on the plaza, the Iglesia Parroquial de la Santisima Trinidad is the largest church in Cuba. This is a place to leave donations. Lunch is at one of Trinidad’s best paladars, Sol Ananda. After lunch, visit the Valle de los Ingenios, or Valley of the Sugar Mills, three interconnected valleys about 7.5 miles outside of Trinidad and another UNESCO World Heritage site. The three valleys, San Luis, Santa Rosa and Meyer, were a center for sugar production from the late 18th century until the late 19th century. At the peak of the industry in Cuba there were over fifty sugar cane mills operating in the three valleys, with over 30,000 slaves working in the mills and plantations that surrounded them. Visit the plantation of Manaca Iznaga, where the owner's house, a tower and some barracones (the original slave quarters) still stand. Drive about 3 hours from Trinidad to the city of Santa Clara to visit the Ernesto (Che) Guevara Mausoleum. The Argentinean Che Guevara was one of the commanders who fought with Fidel Castro in the war against the dictatorship of Batista in the 1950s. He died in Bolivia in 1967 while leading that country’s revolution. His remains were recovered in 1998 and buried in this memorial in Santa Clara Revolution Square. Visit the Armored Train Battle Monument, the site where guerrilla forces commanded by Che Guevara defeated reinforcements sent in an armored train by Batista's army in 1958. Lunch will be at Finca Ta Paladar, delicious food in a countryside ambience. After lunch, continue to Havana for overnight. Visit the Guarderia Padre Usera, a day care for children ages 2 to 5, mostly of single mothers, many teenagers. We will meet the director Sister Theresa visit with the teachers and the kids. This is a perfect place to leave some of the donations you have brought for children. Continue to Callejón de Hamel (Hamel’s Alley) – a community project promoting art, music, and culture. Meet founder Salvador Gonzales and several Afro-Cuban artists for an up-close and personal look at the thriving arts scene. Meet with members of Proyecto Muraleando, a community-oriented project painting the neighborhood and providing workshops in all forms of art, including ceramics, theater, dance & music. For two weeks in April each year, they hold an international, wall-painting symposium. Continue to the Centro Hebreo Sefaradi de Cuba. Meet with Dr. Levy, the head of the community to and hear about the congregation and visit their Holocaust Remembrance Hall. Next, visit the Angeles del Futuro community project in the municipality of Marianoa. Nearly 100 students from 9 to 17 years old participate in workshops on dancing, acting, fitness and circus skills. End the day with a private salsa lesson at 1830 Club. Dinner tonight will be at the La Bonita Paladar, one of the best in Cuba. After an early breakfast, set out for a 2.5-hour drive to Pinar Del Rio, Cuba’s western-most province and primary tobacco growing region. Pass through the beautiful countryside of the Guaniguanico mountain range, agricultural lands, and pine forests. Visit the Hector Luis tobacco farm. Known as Habano-Man, Hector Luis was the youngest man in the world to receive the Habano award in 2008 and in 2009. Next, visit the Viñales Valley, with some of the most spectacular scenery in all of Cuba. Conical limestone hills rise above the fertile valley floor, where small, privately-owned farms dot the landscape. Centuries of erosion has created many underground rivers and caves. Continue for a unique lunch at El Paraiso Paladar, a slice of paradise in the Valley of Silence. It’s part organic farm or finca and part family-run restaurant owned by Wilfredo and his daughters. Lunch is served family-style on the wrap-around porch of the farm house. Wilfredo’s “anti-stress cocktails” are quite legendary in these parts and are the first thing to be served, an herbal concoction of yerba buena, mint, basil and anise with some coconut milk and Cuban rum to taste. We’ll end the day with a tour of the Guayabita del Pinar Rum factory. Return to Havana for overnight. Dinner tonight is on your own. This tour is guaranteed to operate with a minimum party of 2 passengers. If an individual travel party is open to joining with another travel party or parties on any of these published departures (up to a maximum group size of 10 travelers), the per person price will decrease, depending on the final total number of passengers traveling together. For travel on dates other than those listed, the prices below are valid depending on the size of the travel party and the availability of hotel and air space. This tour is guaranteed to operate with a minimum of 2 passengers. If an individual travel party is open to joining with another travel party or parties (up to a maximum group size of 10 travelers) the per person price will decrease, depending on the final total number of passengers traveling together. For travel on dates other than those listed, the prices below are valid depending on the size of the travel party and the availability of hotel and air space. This tour is guaranteed to operate with a minumum of 2 passengers. If an individual travel party is open to joining with another travel party or parties (up to a maximum group size of 10 travelers) the per person price will decrease, depending on the final total number of passengers traveling together. This tour is guaranteed to operate with a minimum of 2 passengers. If an individual travel party is open to joining with another travel party or parties (up to a maximum group size of 10 travelers), the per person price will decrease, depending on the final total number of passengers traveling together.